Welcome to Tombstone Tuesday! 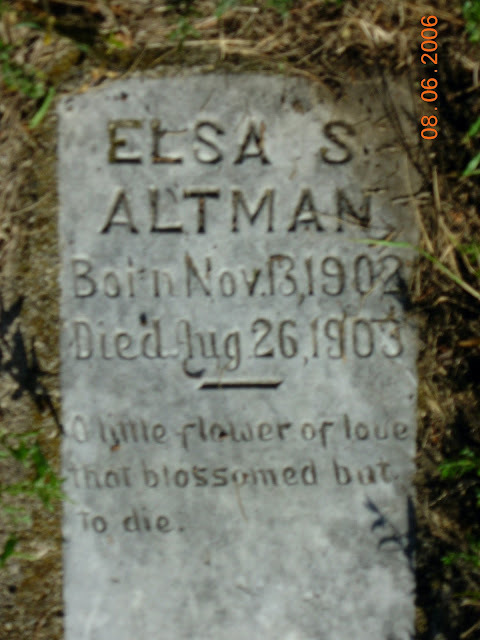 Today we’re looking at the tombstone of my paternal first cousin, twice removed, Elsa Sophia Altman located in Anselm Lutheran Cemetery. Elsa Sophia was the ninth of seventeen children of Robert Altman and Albertina Amelie (Lange) Altman. She had five brothers (three older and two younger) and eleven sisters (five older and six younger). Elsa Sophia was born 13 November 1902 in Anselm, Ransom, North Dakota. She died 26 August 1903 in Anselm, Ransom, North Dakota. Her tombstone inscription reads “A little flower of love that blossomed but to die.” She’s buried in Anselm Lutheran Cemetery in Anselm, Ransom, North Dakota. The cemetery borders what used to be family farmland.